The spectacular second edition of Jazz On The Mountain At Blue saw amazing performances from headliners like the iconic Canadian singer Gino Vannelli, classic R&B legends The Commodores and contemporary jazz sensations Yellowjackets. Jazz On The Mountain At Blue 2014 was an Unique Music Experience. Over the course of the Festival weekend, more than 30 concerts were presented with almost 100 musicians. 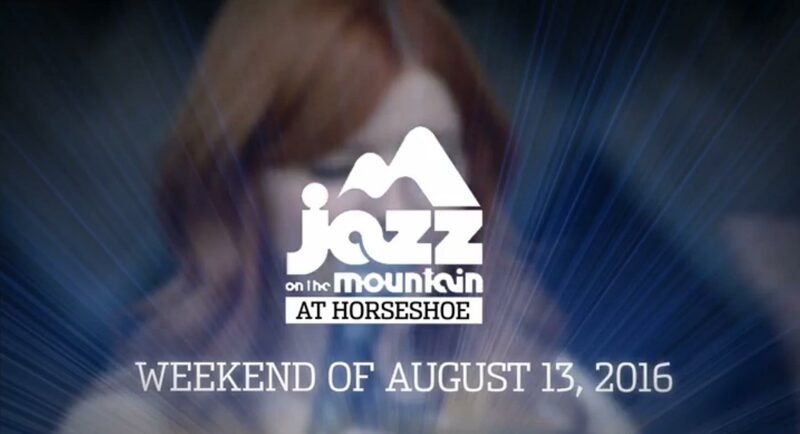 In addition to the ticketed shows at the outdoor Mainstage adjacent to the Blue Mountain Inn, free concerts were presented daily at Events Plaza in the heart of Blue Mountain Village. The jazz continued until the wee hours with the Club Series, featuring both established & up-and-coming musicians and singers. We were also pleased to announce the second edition of our Master Class Series. In an intimate setting, music lovers and students participated in the creation and exploration of jazz in an unforgettable learning experience. Educators for 2014 included Stan Samole (guitar, and Dean of the Master Classes for 2014), Felix Pastorius (bass), Damian Erskine (bass), Russ Ferrante (keyboards), Bob Mintzer (saxophone), and a special drummer’s dream clinic with Will Kennedy and Vito Rezza. 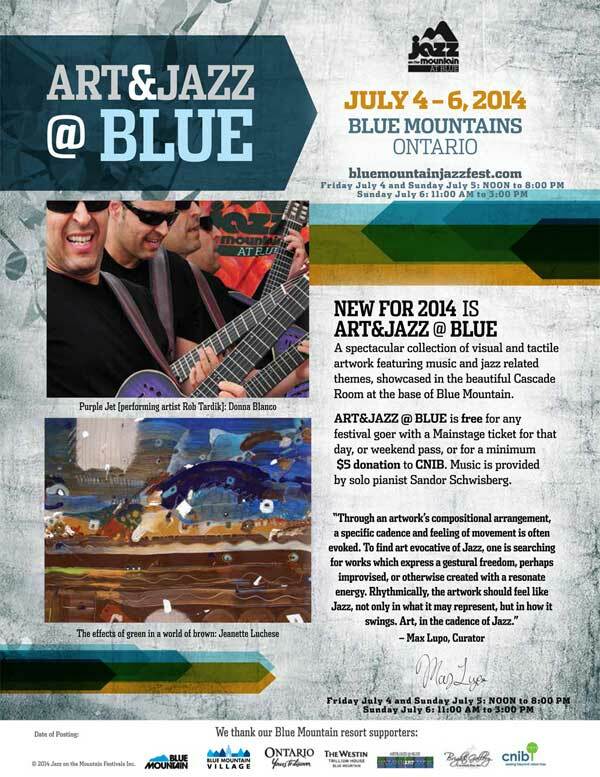 New for 2014 was the ART & JAZZ @ BLUE, a spectacular collection of visual and tactile artwork featuring music and jazz related themes, showcased in the beautiful Cascade Room at the base of Blue Mountain. Born in Montreal in the summer of 1952, Vannelli grew up in a family headed by his cabaret-singing father and a ‘keen-eared’ mother. Instinctively drawn to jazz, drummers in particular, such as Gene Krupa, Buddy Rich, Joe Morello, Ed Thigpen and Elvin Jones, as a child Vannelli studied drums and music theory for five years. Gino’s first foray into pop music came one afternoon as a group of young drummers stood in line, waiting to take turns to audition for a Montreal East group called the Cobras. The rite of passage involved playing a tune called “Wipeout” by the Ventures. Having never heard the song before, Gino made sure he waited to the very last, studying the parts every aspiring drummer played (or was trying to play) That afternoon, Gino came home a little later than usual from school, but as the official drummer for the Cobras. A year later, with his brother Joe holding down the keyboard chair, Vannelli headed up the Motown-influenced Jacksonville 5 (note, this is five years before the Jackson 5 recorded their first record). Along the way there were guitar and piano lessons. The urge to compose words and music followed not long after. At fourteen, Gino began his official singing career when the singer in the band fortuitously couldn’t make the high water mark in a then popular tune by a gritty Welshman, Tom Jones, called “It’s Not Unusual”. Visit Gino Vannelli website for more details. The Commodores, Walter “Clyde” Orange, William “WAK” King and James Dean “J.D.” Nicholas, have remained a force in the music industry for over three decades. “The Legends of Motown”, “Hit, After Hit, After Hit”, “Grammy Award Winners”, “All The Emotion, All the Excitement”, “If You Haven’t Seen Them Live, You Haven’t Heard The Commodores”. The Commodores aren’t just any group. They have staying power. Just like their hit song “Brick House,” the Commodores have created a foundation that just won’t budge. After churning out hit after hit in the Motown days, the Commodores still hadn’t achieved Grammy recognition. This wasn’t to be until 1986, without Lionel Richie, when the Commodores released “Night Shift”. In 1968 the group was formed while all the members were in college at Tuskegee Institute located in Tuskegee, Alabama. After being discovered by Berry Gordy, the Commodores went on to sell over 60 million records for Motown. With hits like “Machine Gun” and “Sail On”, the Commodores became proven artists. They proved it then. They proved it in 1986 with “Night Shift”, and they continue to prove it to this day. Visit The Commodore website for more details. A Rise in the Road, the Yellowjackets’ second Mack Avenue Records offering, is indeed an appropriate title for a time-honored jazz ensemble that has never been fearful of facing newer musical horizons, not to mention the myriad challenges of life itself. Throughout their storied 32-year history, the Yellowjackets have undergone numerous lineup changes, never failing to rise to the inevitable challenges of adjustment. Keyboardist Russell Ferrante and bassist Jimmy Haslip, the dual cornerstones of the group’s 21 previous recordings, were responsible for a sizable chunk of the Yellowjackets’ catalogue. Yet, despite those shifts, Ferrante and Haslip, along with saxophonist Bob Mintzer (23-year member) and drummer William Kennedy (14-year member, spread out between two different time periods), soldiered on with a professionalism that has resulted in 17 GRAMMY nominations – with two wins – countless sold-out tours, and worldwide critical acclaim. Last year Jimmy Haslip announced he was taking a hiatus to focus on other projects and spend more time with his family. Alas, all things must come to an end, as he has decided to make his hiatus permanent. Although his leaving is seismic within the scope of the Yellowjackets’ history – a rise in the road, if you please – change is no stranger to this consistently innovative and adaptable collective. A Rise in the Road introduces a new member – bassist Felix Pastorius – to replace Haslip. Pastorius, whose last name is widely familiar to jazz aficionados, steps in to contribute his talents to the group’s continuing sonic ventures. More on Felix Pastorius in a moment. Visit the Yellowjackets website for more details. This 26 year-old singer-songwriter was born and raised in Toronto, but a colorfully adventurous life to date has helped her develop both as an artist and a self-confident young woman ready to take on the world. After all, how many aspiring soul singers have studying poker in the Ukraine on their resume? Keyboard player and singer, Quincy Bullen has been performing at concerts and festivals since the age of 14. Now in his early 20’s, Quincy has proven to be a formidable interpreter of jazz and pop classics. His funky style along with his incredible piano skills continue to wow audiences in Canada and the Caribbean. His awesome band, which features bass phenom, Saya Gray will be joined by his Juno award winning father, Eddie Bullen. Together they create a wonderful funky jazz and jazzy pop sound. Audiences are charmed by their cohesive musical relationship and unique interpretations of classic music. Visit Eddie Bullen & Quincy Bullen websites for more details. Gone Fission was formed by Grant Crawford in 1991 and consists of 3 of the 4 original members of the critically acclaimed Toronto progressive rock group “Tibet.” Joining forces with David Pleasance (keys, base) and his brother Brent Crawford (drums, percussion) has proven to be a real crowd pleaser at dozens of Jazz festivals as well as radio and television appearances over the past two decades. Gone Fission has recorded six full length CDs with their newest CD “Lean Into It” garnering immediate response including recent distribution and regular air play. The band has the great pleasure of performing with Steve Sherman (The Steve Sherman Project & the 4th original member of Tibet) for all live concerts and performances. The most recent addition to Gone Fission’s live band is percussionist extraordinaire Ian Collins. Visit Gone Fission website for more details. In a career spanning over two decades, Rob Tardik has established himself as an multi-award winning guitarist, successful teacher, entrepreneur, and a Billboard Top 10 charting instrumental music artist. He has performed at venues all across North America including a recent sold out concert at the prestigious Glenn Gould Theatre in Toronto last October. Rob enjoyed a stellar release with his 2011/12 3rd CD release Balance, Energy, Laughter, Love (B.E.L.L.) which spawned 3 U.S Billboard singles two of which went Top 10. Rob was featured on the cover story for the Oct/Nov 2012 issue of Smooth Jazz News Magazine and his single “Christmas Morning” was Billboards most added holiday track last year. B.E.L.L. has also made the top 50 list of 2012 on SmoothJazz.com coming in at #15 and was a top 10 album (#6) for 2011 in “Smooth Jazz News magazine”. Café Jazz Radio named Rob the #1 Canadian Smooth Jazz Artist for 2011 and B.E.L.L. its #1 CD for 2011 as well, and “East meets Wes” the #1 single of the year. Visit Rob Tardik website for more details. Gabriel Mark Hasselbach is a multi wind instrumentalist, performing and recording (mostly jazz) on trumpet, flugelhorn, C and alto flutes, valve trombone, and the Akai EVI wind instrument. He was born and raised in Denver, Colorado, but followed his muse to Vancouver, Canada, where his career on the World Stage started with the success of the multiplatinum Powder Blues Band. After many national, international, and world tours, he launched a solo career with his Polydor album Solar Winds, and his dozen or so albums since then have withstood the test of time, steadily building up his body of work. He has toured world festivals such as Montreux, North Sea, and in UK, Japan, Singapore, Philippines, Mexico, and continues to develop his fanbase through live appearances, and extensive exposure on radio and TV. He has spent the most number of weeks on the Billboard Contemporary Jazz Charts of any other Canadian artist. Visit Gabriel Mark Hasselbach website for more details. Countermeasure is the new sound in vocal music, known for their upbeat blend, sophisticated harmonies, and infectious energy. Led by award-winning composer/arranger Aaron Jensen, and featuring 14 of Canada’s top young vocal talent, Toronto-based Countermeasure’s genre-defying, contemporary sound has earned the group critical and public acclaim. The music covers a broad range of lively pop, jazz, contemporary, and original songs, sung in unique arrangements highlighting the breadth and range of the voice. Dubbed “the leading a cappella chorus out of Toronto” by the Washington Examiner, the group has won praise from critics and fans. “Riding the hot a cappella singing craze, Countermeasure, from Toronto, Canada, is one of the hottest new vocal groups” wrote the Annapolis Patch. Visit Countermeasure website for more details. It may seem strange to call The Ault Sisters veterans, given that Amanda, Alicia and Alanna Ault are, respectively, just 23, 21 and 19. They have left novice status long behind, though, given that they released an acclaimed debut album, Christmas Feelings, back in 2006. They have studied music and performed extensively since then, diligently honing their craft and employing their prodigious vocal skills in a wide range of musical styles, with great distinction. The Ault Sisters have now turned to jazz, a genre in which their signature and sublimely seamless vocal harmonies really shine. The Toronto-based trio released their well received new album, Timeless and are back in the studio with their longtime producer, Greg Kavanagh (BKS, Wendy Lands), and an A-list of local players, recording a keenly-anticipated jazz album – Timeless. Musicians featured on the record include Canadian jazz greats Robi Botos (piano), John Johnson (saxophone) and William Sperandei (trumpet), alongside the ace rhythm section of bassist George Koller and drummer Ben Riley. Visit The Ault Sisters website for more details. Top Pocket began as an R & B band in the summer of 1985. Its original line-up included current members Michael Bergauer on bass and Don McDougall on drums in addition to Conrad (CJ) Griffith on vocals, Ray Dlugokecki on sax and Dave Lonsbury on guitar. Very soon after, a good friend of theirs, Andy Klaehn, booked a jazz gig in Brantford. He hired both Michael and Don and jazz guitarist extraordinaire Glenn Murch. The night was such a success that Don and Michael went home with the idea of changing styles of music for the band. This love for instrumental jazz led to a dramatic change in Top Pocket’s focus. As the original members were not so inclined, Andy and Glenn joined and the “new” Top Pocket Jazz Quartet was born! Move ahead a few years to the early 90’s and the Top Pocket Jazz Quartet was VERY busy playing TWO house gigs at two different clubs each week for a number of years – to packed houses. They were the first after hours house band in the KW region, starting their show at midnight at The Circus Room on King Street in Kitchener on Saturdays (I guess technically it was Sunday morning!). That gig eventually became a more reasonable 9:00 start on Tuesdays after a few months. At the same time, they were playing to loyal fans at the Coyote Bar, upstairs on King Street, in downtown Kitchener, on Thursday evenings. At the time they were known for playing an eclectic mix of styles: be-bop, fusion, latin, traditional and even jazz versions of pop tunes or TV themes could be heard during one of their shows. Visit Top Pockets website for more details. Something, such as a sudden creative act or idea that is inspired. If you have met Will Kennedy or if you have seen Will Kennedy perform, you understand that inspiration and Will Kennedy are inseparable, if not synonymous. Whether it was during his many years as a member of the fourteen time Grammy nominated group Yellowjackets, or on one of the myriad other Artist’s records or tours, Will has always been credited for being the inspirational drive in the music. His musicality and finesse are legendary amongst the “who’s who” of the jazz world and beyond. The last few years have been busy ones for Will. He has been the house drummer for The Wayne Brady Show on ABC and the Martin Short Show. He has been touring with Chaka Kahn, Lee Ritenour and Jonathan Butler. He continues to do sessions which includes recording and performing in the movies “Lady Killers” starring Tom Hanks and the academy award nominated “Sideways”, as well as recording with Mick Jagger/Dave Steward for the soundtrack theme for “Alfie” starring Jude Law. Will has conducted drum clinics around the country and released an educational video on Warner Bros. Will endorses some of the finest equipment manufacturers including Pearl, Zildjian, Promark, Evans, Shure, and XL Cases. Follow Will Kennedy on Facebook. Making music comes natural to Felix Pastorius. A family tradition, his grandfather John Francis Pastorius II, affectionately referred to as “Jack”, was a stand-up jazz drummer, that would sing while he would swing. Following in his footsteps one of Jack’s three sons, Felix’s dad, John Francis Pastorius III, took up the drums and later switched to bass. He was affectionately referred to as “Jaco”. Spending most his life living in Florida, he was always surrounded by a house full of instruments. While studying them all, he landed on the bass, or maybe it landed on him. He’s earned his place, learned to navigate, and here to take you for a ride. He is affectionately referred to as “Felix”. Visit Felix Pastorius website for more details. Visit Bob Mintzer website for more details. Visit Russ Ferrante website for more details. There is far more to Vito Rezza than superb stickhandling skills, however. He is also a bandleader and composer with a string of highly-acclaimed albums under his belt. For the past 22 years, Rezza has led Canadian ensemble 5 After 4, and the band has opened for the likes of Bela Fleck and the Flecktones, SpyroGyra, Kevin Eubanks, Boss Brass, and Joe Henderson. 5 After 4 released their sixth record, Rome In A Day, last year, on the ALMA Records label. The eleven-track disc featured six Rezza original compositions, and it confirmed he’s at the peak of his powers in all his different roles. Damian is known for his ability to fit into any musical situation, extraordinary reading and improvising skills as well as being an educator and columnist. He has played in the studio or on the stage with the likes of . Peter Erskine . The Jaco Pastorius Big Band . Les McCann & Javon Jackson . Gino Vannelli . Jeff Lorber . George Colligan . Sveti w/ Marko Djordjevic . Vardan Ovsepian . Charmaine Neville . Tony Furtado and many others as well as being featured on the GospelChops.com “Shed Sessionz Vol. 1” DVD. Damian is an adjunct professor at Portland State University in Portland, Oregon and has also appeared as an instructor at Gerald Veasley’s Bass Bootcamp, the National Guitar Workshop as well as the Berklee College of Music’s Guitar Week. Damian has also written for Bass Player Magazine, NoTreble.com, Bass Musician Magazine as well as authoring his own books, “Right Hand Drive” and “The Improvisor’s Path”. Visit Damian Erskine website for more details. Visit Chris Smith website for more details. Are you having any fun? When Alex Pangman is singing, a resounding ‘yes’ is the only possible answer to that query posed by the Sammy Fain/Jack Yellen classic. With legendary guitarist Bucky Pizzarelli on board for Pangman’s latest, the merriment comes all the easier. Have a Little Fun finds the young Toronto chanteuse doing just that on a baker’s dozen of swing era standards and originals penned in the same vintage style. Along with Pizzarelli, a seven-decade veteran who’s played with Les Paul, Benny Goodman, and Stephane Grappelli, Pangman is joined by her long-running band, The Alleycats. Since her teens, Pangman has earned a devoted following in her native Canada, garnering three National Jazz Award nominations, twice as “Jazz Vocalist of the Year” and once for “Best Original Song,” and she has performed three showcases at the renowned Festival International de Jazz de Montréal. Visit Alex Pangman website for more details. Cited as “a new name on the vocal jazz scene whose powerful voice has been turning heads,” Jordana has actually been singing for most of her life. Her passion for and proficiency at singing was displayed at an early age. As a member of the Canadian Children’s Opera Chorus, she performed with several ensembles, among them the Canadian Opera Company, Toronto Symphony and National Ballet of Canada, gaining experience in radio, TV, and theatre en route. In high school she attended the renowned Claude Watson Arts Program at Earl Haig Secondary in Toronto, majoring in voice. She also began classical training that continued through her time in Montreal as a student at McGill. There, she branched out of the classical genre, joining a funk band (Kokoro), an acapella group (Effusion) and a Gilbert & Sullivan theatre company (Savoy Society). She became a regular performer at Maggie’s Supper and Jazz Club in London, Ontario while studying law at the University of Western Ontario. Visit Jordana Talsky website for more details.